Copyright © 2012 by Eric M. Jones. Do the Apollo flags remain where they were planted or have they fallen or have they disintegrated after four decades of exposure the lunar environment? Reichhardt, Tony, Finding Apollo, Air and Space, Smithsonian Institution, September 2008. Based on the new (LRO) images, that mystery may remain unsolved, but (LRO Camera Principal Investigator, Dr. Mark) Robinson is skeptical that the flags are intact, if they are still there. The moon's extreme heat and ultraviolet conditions would probably destroy the nylon flags over time, he explained. "Personally, I would be surprised if there's anything left on them," Robinson said. "You know how [if] you leave a flag out over summer, how it starts to fade. 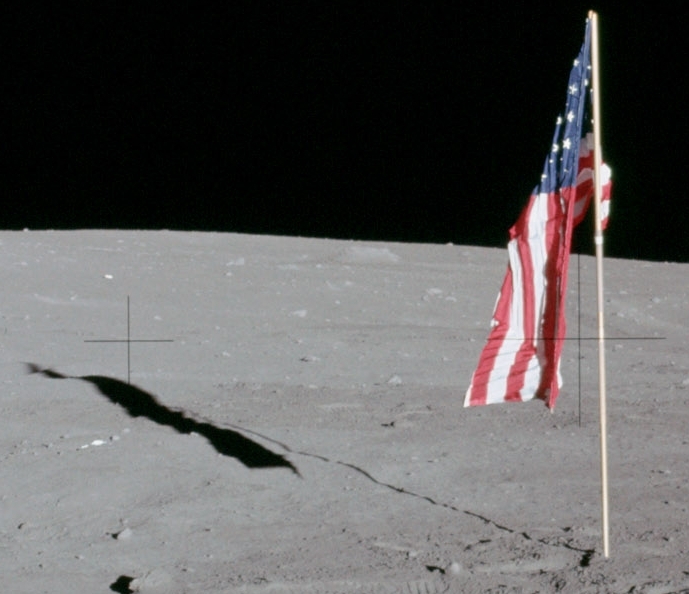 Now, imagine the extreme UV environment on the moon, and the hot and cold cycling, and it's been 40 years — so if the flags are still there, they're probably in pretty rough shape."…. (Robert Pearlman, an expert on space history and collectibles, and editor of collectSPACE.com said) "We didn't design a special American flag to go to the moon to last thousands of years. They literally sent out a secretary to the nearby Sears and bought an off-the-shelf flag and modified it. The natural disintegration of the flag's material in the harsh conditions on the moon's surface is to be expected." Axelrod, Jim, What happened to the American flags on the moon?, CBS News, July 2011. (Historian Anne Platoff) believes the first two (flags) from Apollo 11 and 12 did not survive the ignition gases of the lunar liftoff … "It wasn't the intention for the flag material itself to last. It was just to be there during the event - the landing and departing from the moon. We didn't have a requirement that the flag, the U.S. flag, had to withstand all the environments for eons". Made from nylon just like the ones at a dime store, though ordered off the shelf from a government supply catalogue, Annie Platoff's theory is they are probably darkened and maybe more than a bit tattered. "I would guess, over time, 40 years, the combination of sun-rot and micro-meteor impact is probably devastating. I mean it's not a pretty picture to paint. The only way you're going to test these theories is to go back to the Moon and look at the flag," Platoff says. For forty-odd years, the flags have been exposed to the full fury of the Moon’s environment – alternating 14 days of searing sunlight and 100° C heat with 14 days of numbing-cold -150° C darkness. But even more damaging is the intense ultraviolet (UV) radiation from the pure unfiltered sunlight on the cloth (modal) from which the Apollo flags were made. Even on Earth, the colors of a cloth flag flown in bright sunlight for many years will eventually fade and need to be replaced. So it is likely that these symbols of American achievement have been rendered blank, bleached white by the UV radiation of unfiltered sunlight on the lunar surface. Some of them may even have begun to physically disintegrate under the intense flux. "Bleached", “disintegrated”, “ashes”, “rough shape”, and “tattered”. Intuitively, experts mostly think it highly unlikely the Apollo flags (See Platoff's article Where No Flag Has Gone Before: Political and Technical Aspects of Placing a Flag on the Moon for details), could have endured the 42 years of exposure to vacuum, about 500 temperature swings from 242 F during the day to -280 F during the night, micrometeorites, radiation and ultraviolet light, some thinking the flags have all but disintegrated under such an assault of the environment. Fortunately the outstanding high-resolution images from the Lunar Reconnaissance Orbiter camera of the Apollo sites enable us to see if any of the flags still cast shadows. Examining the detailed images by themselves (i.e. separately) provide a somewhat ambiguous impression of the flags. It is known the astronauts walked around the flag poles a great deal and disturbed the regolith (lunar dirt) so the appearance in any one image can give the illusion of the location of the flag only or perhaps what appears to be the flag pole itself. When a person looks at a shadow, they normally expect it to start at the object casting the shadow that starts at the object and extend out to a distance that depends upon the elevation of the Sun and the slope of the ground on which the shadow falls. In the case of a flag supported by a thin pole, the shadow of the pole starts at its base, but the nearest part of the flag shadow is some distance away from the pole, unless the Sun is near the zenith. Detail from Apollo 12 photo AS12-47-6983 showing the deployed flag and its shadow. The latch failed on the pivot designed to hold the top edge of the flag out perpendicular to the pole on a supporting rod, so the flag hung limp. The photo was taken at about 1455 UTC on 19 November 1969. The Sun's elevation was 9.2 degrees. Platoff describes the flag as being 5 by 3 feet (1.5 by 1.0 meters). Because the supporting rod is close to vertical, we can estimate that the part of the pole above ground is about 7 feet (2.1 m) tall and that the bottom of the flag is about 2 feet (0.6 meters) off the ground. On level ground, the far end of the shadow would be about 13 meters from the pole. The bottom of the flag is about 0.5 m above the surface and its shadow would be about 3 meters from the pole. In August 2011, the author combined LROC images of each Apollo site taken at roughly the same orientation (i.e. spacecraft-to-lunar surface site angle) but with different Sun angles to show the travel of shadows. Combined with knowledge of the Apollo site maps which show where the flag was erected relative to the Lander, long shadows cast by the flags at three sites - Apollo 12, Apollo 16, and Apollo 17 - show that the these flags are still “flying”, held aloft by the poles. On page 239 in his book, Return to Earth, Buzz says that, during the liftoff from the Moon, "There was no time to sight-see. I was concentrating intently on the computers, and Neil was studying the attitude indicator, but I looked up long enough to see the flag fall over." As expected, there is no indication of a flag shadow in Apollo 11 LROC images. 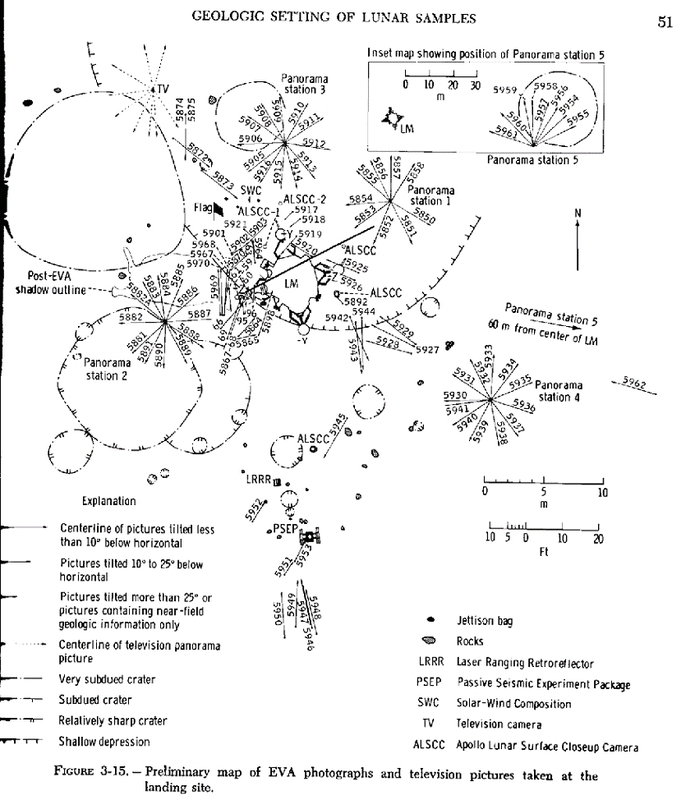 Figure 3-15 from the Apollo 11 Preliminary Science Report shows the location where the flag was deployed. The second and third frames in the animation shows ground disturbed by the crew between the MESA and the TV camera. The flag was deployed in that area. Strong shadows visible in a sequence of five LROC images. A detailed discussion can be found on a separate page. As discussed on a separate page, shadows cast by the S-band antenna and the MET are visible, but there is no clear indication of a flag shadow, perhaps because of some combination of flag orientation, image resolution, image brightness variation due to terrain rugosity, other pieces of shadow-casting hardware of various descriptions, and proximity to the LM. As discussed on a separate page, images from the LRV-mounted TV camera show that, a few hours after LM liftoff, the Apollo 15 flag was still standing and pointed on an azimuth of about 50 degrees north of the solar azimuth. There is no clear evidence of a flag shadow in the LROC images. Strong shadows visible in a sequence of seven LROC images. A detailed discussion can be found on a separate page. Strong shadows visible in a sequence of six LROC images. A patch of soil disturbed by the crew during flag deployment and picture taking shows up clearly in the fourth and fifth images. A detailed discussion can be found on a separate page.